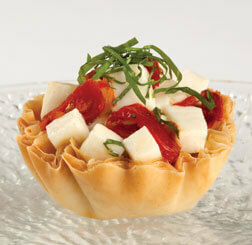 This simple-to-prepare appetizer features a burst of flavor from fresh mozzarella and sun-dried tomatoes, made even more irresistible with a Mini Phyllo Shell crunch. In a medium, non-metal, mixing bowl, combine mozzarella, sun-dried tomatoes, 1 tablespoon basil, vinegar and oil. Mix thoroughly. Fill mini shells with one heaping teaspoon of mixture. Garnish with flake sea salt and the remaining basil. Serve. Now you can get that mimosa flavor you love in a dessert! 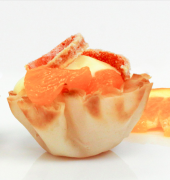 Champagne, mandarin oranges and whipped cream come together to make these simple, citrusy phyllo bites. Great as a treat with brunch or as finger food for your next event! 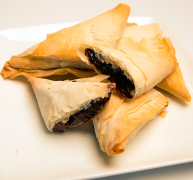 These hard-to-resist desserts wrap a warm cream cheese and Nutella filling in a flaky phyllo pouch.